ID900 Time Controller from ID Quantique. How does it work? Home | ID900 Time Controller: How does it work? ID900 Time Controller: How does it work? Science never stands still, it is constantly evolving. So too are your needs. That’s why, with the ID900, we’ve developed a device that evolves with you. Traditionally, we have satisfied new requirements in performance and functionality by regularly releasing new hardware. With the introduction of the new ID900 Time Controller, we begin a new age of transformative technologies that evolve alongside your changing needs. By releasing a series of software and firmware upgrades over time, rather than new hardware, your ID900 can keep pace with advances in technology to incorporate improvements in functionality and performance from within the same chassis – delivering a longer-term return on your hardware investment. The ID900 is a multi-purpose device, able to fulfil the role of multiple devices within the laboratory. To create this flexibility, we based the device on a powerful filed-programmable gate array (FPGA). However, the timing resolution typically associated with an FPGA is around 5 nanoseconds, nowhere near as accurate as we needed. 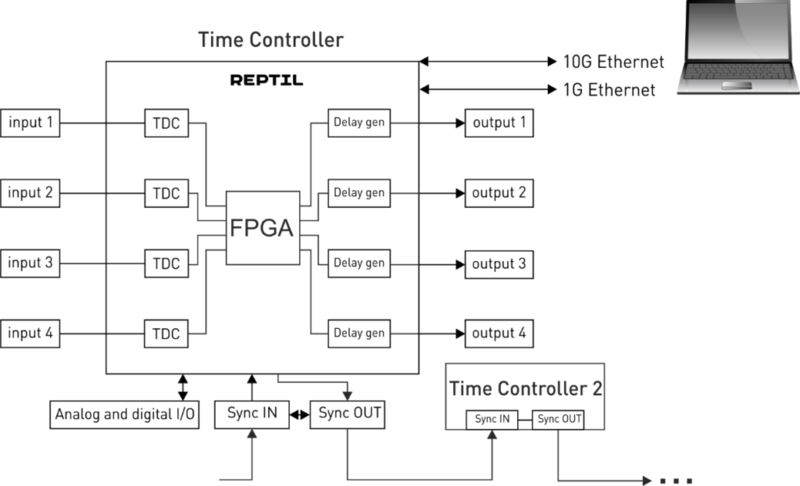 To overcome the accuracy challenge we developed, and patented, Reconfigurable Picosecond Timing Logic (REPTIL); which allows us to combine the reconfigurability of the FPGA with timing accuracy on the picosecond scale. Here’s how the new time controller works. The arrival time of a pulse on each input is digitized to high resolution (~10ps) with a TDC. This data is transferred to the FPGA, where it is processed in parallel. This processing may simply be data acquisition, but can also be any real-time signal processing; such as generating a delay, a pulse pattern, or a logic gate. To generate the output with 10ps resolution, we employ a set of delay generators that can be dynamically adjusted. In this way, we create a digital processing engine that can be reconfigured with each release to improve functionality and, at the same time, has a temporal resolution of the order of 10ps. The ID900 Time Controller is scalable in terms of the number of channels it can handle. This is thanks to the advanced synchronization circuit, which allows up to 16 ID900s to be connected to each other, with a device-to-device jitter of less than 2ps. Data transfer is also scalable, via a 10Gbps Ethernet link.